None is necessary. Some is good, lots is great. For 15 years we have taken all levels of experience out. We have several “kid friendly” horses. All our horses are rideable by adult first timers. Is there a weight limit? Yes, the horses request that their riders are under 250lbs . If you have ridden before and/or are physically fit, then exceptions can be made. If you are above 225lbs, please notify the guides before the ride so we can get a bigger horse for you. What is the minimum age to ride? Our minimum age is 8 years old. Sorry no exceptions. We do not allow double riding for safety reasons. Before every ride we instruct our riders on the basics of riding, anyone that cares to ask can get more instruction as the ride goes on. Please wear long pants and some kind of boots or running shoe, sandals are not allowed. 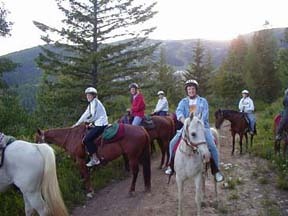 Keep in mind that horseback riding is a physical activity, so wear clothing that is suitable for a rugged outdoor activity. What else to bring? 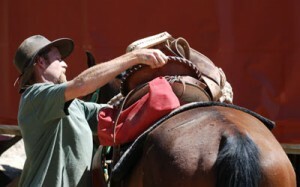 There are packs on the saddles so please bring water, light jacket or rain gear, snacks and cameras are welcome. Wear sun protection. Even on the hottest days our ride goes through lots of shade, when we do come out in the sunshine, we are rather high in altitude and there is a breeze. Should I Tip? Yes, This is a guided service, so tips between 10% and 20% are reccomended. Hug your horse too! Call and ask. We are glad to help. 208-263-8768 (TROT) .